It could cost thousands of dollars if producers do not pay sufficient attention to the air quality in broiler houses at night, warn Michael Czarick (Extension Engineer), Brian Fairchild (Extension Poultry Scientist) and Brian Jordan (Assistance Research Scientist) with the University of Georgia. During cool weather, maintaining good air quality is vital to avoid bird health issues. It is a 24-hour-a-day, seven-day-a-week, job. One of the most important air quality variables that must be kept to a minimum is ammonia. High ammonia levels can paralyse and/or damage a bird’s tracheal cilia, which are a vital tool a bird uses to fight off disease. The cilia are microscopic finger-like projections that cover a birds trachea. A thin layer of sticky mucus covers the cilia which can trap pathogens travelling on small particles in the air. 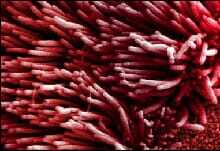 The cilia move in a wave-like pattern pushing the pathogen-carrying mucus up to the birds’ mouths where they then swallow it and the pathogens are killed off by digestive acids. But, if the cilia are paralysed and/or damaged by high ammonia levels the pathogens can then travel through the stationary mucus layer down to the tracheal base cells where they start multiplying causing the birds to get sick (i.e. bronchitis). Worse yet, the pathogens can kill off the cilia cells which makes it easy for a wide variety of other pathogens to be introduced into the bird, leading to secondary infections (i.e. E. coli). Though long periods of high ammonia are of greatest concern, it is important to realise that research has shown that acute spikes in ammonia are potentially more damaging than constant low levels of ammonia. 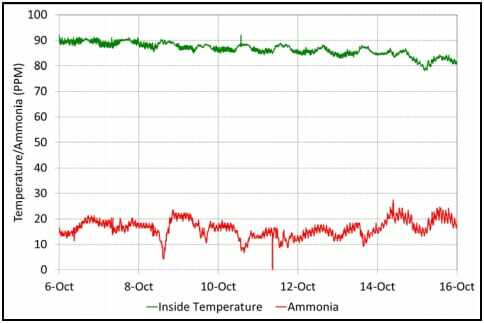 This is why producers have to make sure that ammonia levels are kept to a minimum not only during the day, but at night as well. During the cooler times of the year air quality during brooding tends to be fairly consistent over the course of the day. This is because air exchange rates are determined by minimum ventilation fan timer settings which most producers leave the same 24 hours a day. Furthermore, since the young birds are not producing a significant amount of heat and outside temperatures are well below target temperatures the house never goes into 'cooling' mode where ventilation rates would increase. As a result, if the ammonia levels are low in the afternoon it is typically safe to assume that they would be low in the middle of the night (Figure 2). Unfortunately, the same cannot be said for later on in the flock. 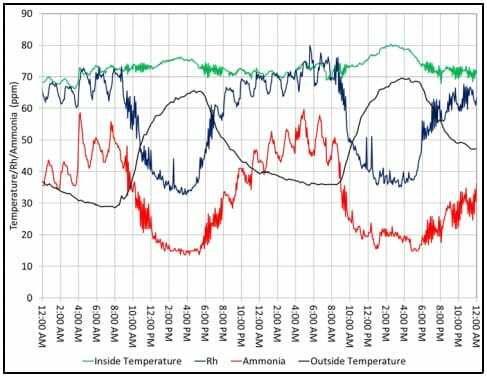 Diurnal variations in air quality in poultry houses can prove problematic for poultry house managers. For the most part, air quality is evaluated during the daylight hours when the birds are being tended to. If the ammonia levels appear acceptable, ventilation rates are typically not changed. Herein lies the problem. Just because ammonia levels are acceptable during the day does not necessarily mean that there are not potentially harmful levels at night. It is important to keep in mind that ammonia concentrations in a poultry house are generally proportional to ventilation rates. As a result, if ventilation rates are reduced by 50 per cent at night because the minimum ventilation fans are only operating off of interval timers and not temperature, the ammonia concentrations will be twice as high at night than they were during the day. 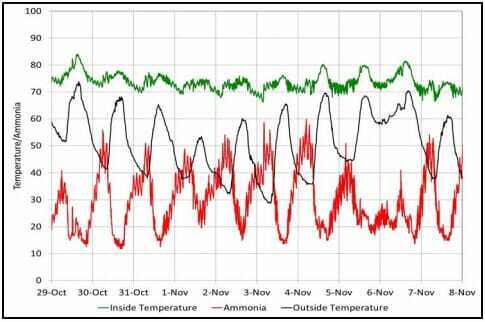 If the fans are only operating one-third as much at night, ammonia concentrations can be three times as high at night than they were during the day (Figure 3). The fact that air quality can vary dramatically from day to night can lead to unexplained bird health issues. It’s a frustrating situation. House temperatures are correct, ammonia levels are less than 20ppm, the relative humidity and dust concentrations are low; everything appears ideal but mortality is climbing and the birds are starting to show signs of the onset of respiratory disease. Why are the birds becoming ill? It is important to realise that there is always some type of disease challenge present in a poultry house. Twenty four hours a day, seven days a week, 52 weeks a year, the birds are constantly being challenged. It is not that different from the respiratory disease challenges (i.e. colds and the flu) we face during cold weather. Most of the time, the bird’s immune system can deal with the challenge. But, the magnitude of the challenge tends to increase during cold weather because the concentration of any pathogen that may be present in the house increase as ventilation rates decrease (for us as well as we spend more time indoors). At night, the situation can become critical as outside temperatures drop and the air exchange rates decrease to their lowest levels while pathogen concentrations and ammonia concentrations are at their highest. The combination of increased pathogen and high ammonia concentrations tend to suppress a bird’s immune system. When this occurs for eight hours a night for multiple nights in a row that is often all it takes for a respiratory disease to take hold. So how do we know if we are ventilating enough at night to control ammonia? Ideally ammonia concentrations, like house temperatures, would be monitored 24 hours a day, but this is simply not practical. An accurate ammonia meter like the one used to produce the graphs in this newsletter costs approximately $10,000 and costs thousands of dollars a year to maintain. A second option of course would be to get up every night and check the birds at 3am – again, not very practical. The fact is we can get a pretty good idea of what is happening at night by simply monitoring house humidity levels (Poultry Housing Tips. 'Relative Humidity...The Best Overall Measure of Poultry House Air Quality'. Vol.24, No.2). Though relative humidity is primarily a measure of house moisture levels it is also an indicator of other important air quality variables such as ammonia and carbon dioxide (Figure 5). A high relative humidity is typically an indicator of low air exchange rates and as a result ammonia and carbon dioxide levels will also tend to be high. 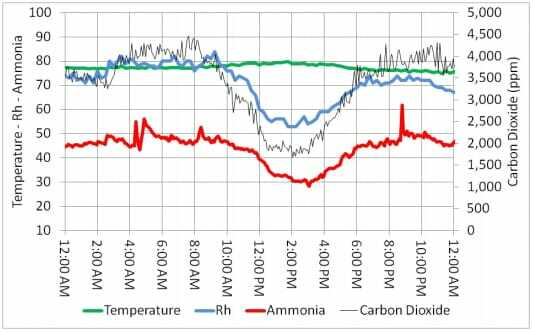 If there are wide variations in relative humidity levels from day to night then there are very likely wide variations in ammonia concentrations. Furthermore, if the relative humidity at night is over 70 per cent on a regular basis, chances are ammonia levels are becoming excessive at night (Figures 4 and 5). One of the best ways to monitor relative humidity is through a house’s environmental controller. A modern controller can continuously monitor relative humidity and keep a record of how high the relative humidity is each night. Some controllers will even increase minimum ventilation fan runtime a set amount if relative humidity climbs above a set level which can prove extremely helpful for making sure proper conditions are maintained in the middle of the night. 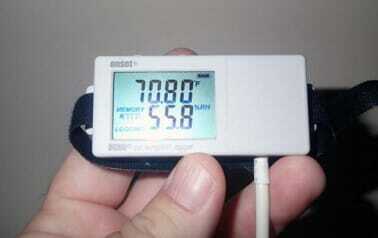 Another option would be to use a temperature/relative humidity data logger such as the Onset UX100-023. The UX100-023 is cable of recording temperature and relative humidity every five minutes for an entire flock (30 days using a one-minute sample rate) and unlike many other data loggers, displays the current readings. High/low relative humidity limits can be set and if reached they can be displayed and reset with a simple push of a button on the top of the logger (Figure 6). A relative humidity sensor for an environmental controller or accurate temperature data logger such as the UX100-023 will typically cost between $200 and $300. Though this may seem excessive, the information they can provide about air quality in poultry houses in the middle of the night is incredibly valuable. In the end, we can do a great job of providing the ideal environment for our birds during the day but if our birds become sick because we are ignorant of what is happening in our houses at night, the cost can easily climb into the thousands of dollars for both the poultry producer and the poultry company.